The tragic death of Gerry Birrell in practice for the 1973 Grand Prix de Rouen had brought into sharp focus that Six Frères was now too dangerous, and something had to be done. 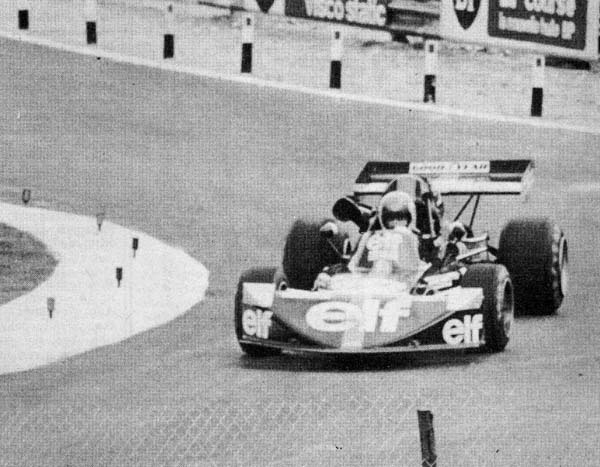 The temporary chicane set up before the '73 race had come under heavy criticism as it broke apart time after time, so something more permanent had to be done. 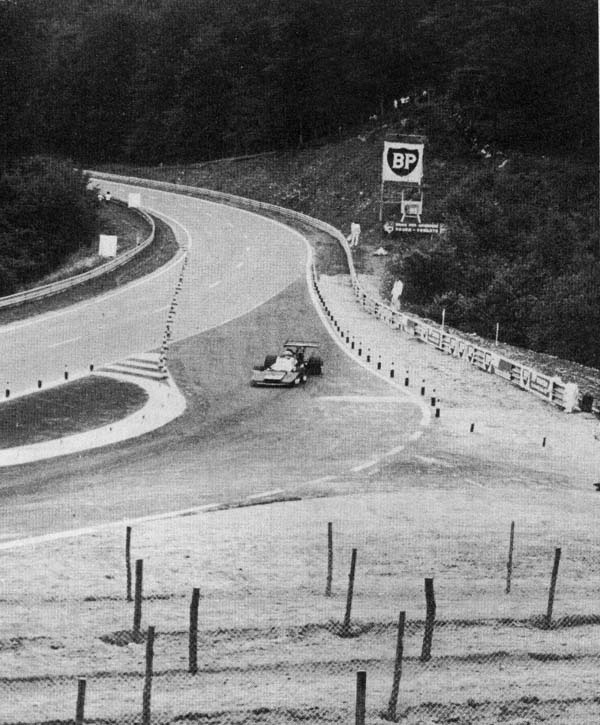 The answer: a permanent chicane was built at Six Frères and the new section was renamed Virage des Roches. To do this, the embankment on the outside was dug out, the new piece of road constructed in its place, and catch fencing and run-off installed, with a new more sturdy barrier well back from the road. The chicane was a 2nd-gear corner, adding around 4 seconds to the lap time. One of the sport’s greatest corners was gone forever. The 2 works March 742s of Hans-Joachim Stuck and Patrick Depailler headed the entry list with the semi-works March 742 of Jacques Coulon. 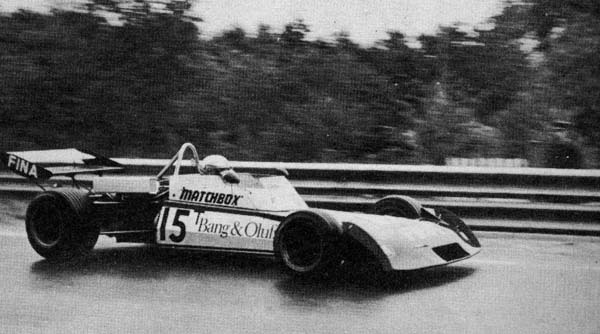 There were 4 Elf-Schnitzers which were split into two teams: Jean-Pierre Jabouille and new boy Patrick Tambay arrived in team one, while Michel Leclerc and Alain Cudini were in the second team. Hesketh F1 star and former winner at Rouen James Hunt arrived for a rare F2 drive with the Ottershaw Motors Chevron B27, Marabout Racing entered a GRD for Claude Bourgoignie, Bob Marsland had an Astroturf sponsored Chevron B27, and Bob Harper had Chevrons for David Purley and Dieter Quester. Japanese driver Masami Kuwushima had a Sanyo March, and John Surtees brought four of his cars for John Watson, John Dolhem, Pierre Dieudonné and Bernard de Dryver. BP Racing brought just the one March 742 for Jacques Laffite after Jean-Pierre Paoli’s big accident at Hockenheim, and the rest of the entrants were Bill Gubelmann in his March, Dave Walker in a similar car, and George Schaffer in the lone Ford-powered Pygmee. The whole weekend was plagued by bad weather, with Thursday practice starting dry and the rain coming later on, while Friday it was the other way around. Controversy struck the Surtees team almost immediately, with team boss John Surtees deciding the inexperienced Belgian pair of Dieudonné and de Dryver wouldn’t race after all, reasoning that Rouen was not the place for young drivers to make their F2 debuts. Both drivers were naturally upset, but the decision was final and it left Watson and Dolhem with a spare car each for the weekend. Stuck claimed pole with a lap of 1m 48.3s, 1 second quicker than anyone else, timing his runs in the wet/dry conditions to perfection. Leclerc was next on 1m 49.3s, the young Frenchman impressing many with his speed, particularly in relation to his more experienced fellow Elf driver Jabouille, who had to settle for 4th 0.6s slower. Splitting the two Elfs was David Purley, the fearless Englishman showing excellent pace in his Chevron, to secure a 1m 49.7s time. 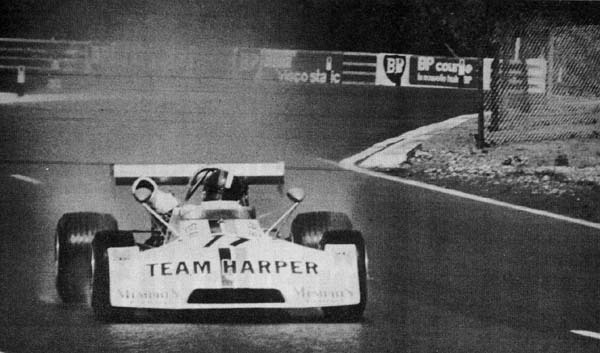 5th was Coulon with a 1m 50.2s, followed by the unhappy Depailler, who made it known that he had no time for Rouen, describing it as a “dangerous place but I have my commitment to my sponsors”. Row 4 was led by Hunt. The flamboyant Englishman had battled with engine maladies on both practice days to record a 1m 50.9s time, and he would need a new engine to be flown over from Bolton for Sunday. Quester was next, seemingly not the same driver he was before his abrupt retirement, on 1m 51s dead, over a second slower than team-mate Purley. Laffite managed 9th, while Tambay impressed many with his 10th placing. 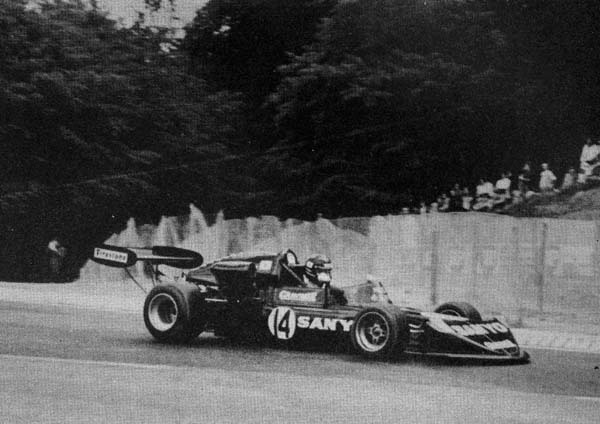 Cudini was slowest of the Elfs in 11th spot, and Watson qualified 12th but was unhappy with his BMW-engined Surtees and elected to have a Ford installed for the race, meaning he would start from the back. The rest of the qualifiers were in order: Walker, Gubelmann, Dolhem, Bourgoignie, Kuwashima, Marsland and finally Schaffer, a full 24 seconds slower the Poleman Stuck. 19 cars would greet the starter’s flag on Sunday. Sunday was very inclement, with showers one minute and bright sunshine the next. It meant that everyone would have to go back to wet settings during the morning warm-up. Stuck’s weekend almost came to an abrupt end during this session when he had a tyre fail at high speed, forcing into a huge spin. Cudini was even less fortunate, planting his car in the Armco and ending his weekend before the race had even begun! The wet/dry conditions would make for a very interesting race, but slicks were much in evidence at the start. It was Leclerc who got away best at the start, but Stuck nabbed him at the final corner to have the lead after lap 1, followed by Jabouille, Coulon, Purley, Depailler, Lafitte, Dolhem, Hunt, Kuwashima, Tambay and the rest. Just before lap 2 was completed, the skies opened with a torrential downpour. Everyone crept around the sodden track on their slicks, trying desperately to keep their cars off the walls. The weather was so bad that most expected a red flag, but none was forthcoming. Purley managed to get in for wets at the end of lap 2, thus giving him an advantage over the others, who all had to creep around another lap before they could come in for wet tyres. Amazingly, the only driver who didn’t survive was Dolhem, who slithered into the guardrail on lap 3. James Hunt meanwhile had had enough. After a huge moment coming on to the main straight, he stopped his car at the pit entry, leaped out, grabbed a pit sign and began trying to stop the race, brushing aside a race official as he did so. His efforts were futile though, the race was not stopped and Hunt was instantly disqualified from taking any further part. Stuck somehow emerged from his tyre stop still in front, with Jabouille struggling around on his slicks, hoping against hope that the rain would stop and he would profit. Purley and steamed back to 3rd on his wets, Watson was now 4th, Coulon 5th, Tambay 6th, Leclerc back in 7th, and the rest. Jabouille’s gamble had failed, and after a couple of very slow laps, he decided discretion was the better part and joined the wet tyre brigade. Coulon spun, and Depailler was well back after suffering a minor engine problem that his team fixed as they changed his tyres. Stuck though was rocketing away, his Firestone wet tyres much better than his Goodyear shod counterparts. He stopped on lap 12 for a left rear tyre as the track dried, and still emerged 25 seconds clear of the rest! Following his stop, he continued to march off into the distance at a rate of 2 seconds per lap. Laffite was now on the charge, getting past Tambay and Coulon, without too much trouble, passing Leclerc on lap 15 and dispensing with Watson on lap 17. With the track now certainly drying out Depailler was the first to change to slicks, and soon most of the field was doing the same, except Stuck who was continuing to serenely romp away. Suddenly on lap 18, Stuck charged into the pits for a 3rd time, his wets finally starting to give way. Four new slicks were fitted and he resumed in 5th. Laffite did the same on lap 20. Stuck immediately showed his superiority over the rest of the field by comfortably rounding both Leclerc and Coulon, by lap 22 he was into second and closing rapidly on Purley. Purley then spun at the final corner, and Stuck was through and gone on lap 27. However there was controversy in the pits, with Purley’s team believing he was in front, and that Stuck, who had stopped 3 times, must have been unlapping himself. Watson meanwhile retired from sixth as his nose cone, which had been dragging on the ground, finally came clean off with a few laps left. Stuck careered away once again, finishing 50 seconds clear of Purley at the flag. Leclerc was next, followed by Coulon, Tambay, the charging Laffite, Depailler, Jabouille, whose race had been badly compromised by his early gamble on slicks, Quester and Gubelmann. Kuwashima was unlucky not to finish, moving aside for Stuck to pass he slithered off into the fence and couldn’t continue. At the finish, the controversy about who had won escalated further, with the Alpine team believing that not only had Purley won, but Leclerc had finished second! After checking with the race officials however, it soon became clear that Stuck had indeed won the race, with Purley second and Leclerc third. An exciting end to a very interesting race for 1974.